Sanae Downer (centre), marketing intern at the JN Bank discusses the merits of saving with sixth form students at the St Elizabeth Technical High School (STETHS) during a JN School Savers’ Dream Big Tour at the institution recently. A senior high school teacher is recommending that financial literacy be added to the curriculum of secondary schools, to assist students to make better-informed financial decisions as they graduate and enter the world of work. 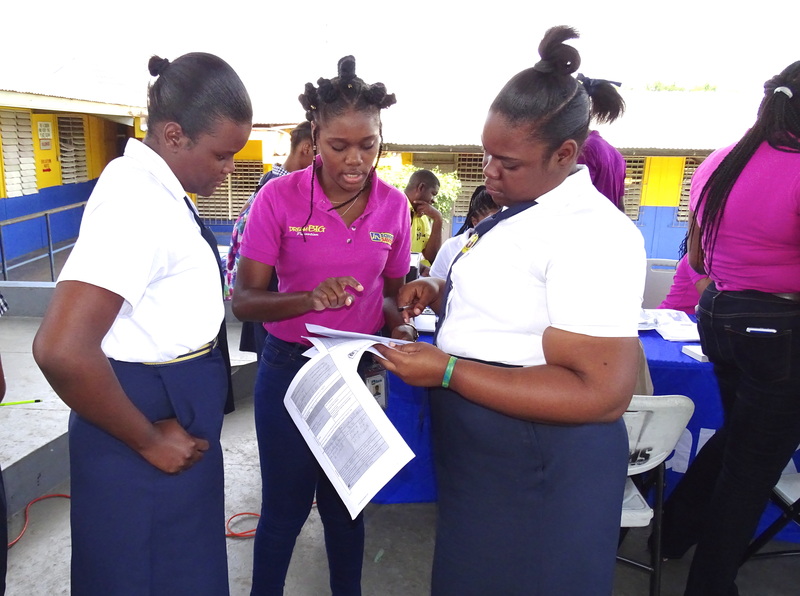 Rema Downes, senior teacher and grade coordinator at the St Elizabeth Technical High School (STETHS), said that exposing children to financial education from an early age will help to create more financially responsible citizens. Miss Downes made those comments at a JN School Savers Dream Big Tour, at the St Elizabeth education institution, recently. “I believe that while chemistry and physics are important, it is also worthwhile to expose our children to certain everyday life skills, which will be of enormous benefit to them as they enter the workforce,” she noted. Miss Downes, who is also the JN School Savers Coordinator for STETHS, further noted that many financial mistakes that adults make throughout their lives could be minimised, if they were taught at an early age to be good stewards of their money. “Learning is achieved through personal experience. Making mistakes with your credit is a painful way to learn a life lesson,” she remarked. At the same time, Miss Downes commended the JN School Savers initiative, and said, “The programme has been doing its part to encourage children to develop the habit of thrift and to make wise financial decisions. “The saving initiative is an excellent programme, because it forms part of the ground work to encourage children to save. If they learn to systematically put a little aside from an early age, later as adults, saving and investing will become second nature,” she reasoned. Miss Downes also noted that the programme makes her job much easier, as encouraging teenagers to save can be a challenging task. “Many teens have an immediate outlook on life; therefore, they will save, but for the most part, it’s to purchase gadgets, such as a new cell phone. But, to put aside money for later on in life, to contribute to paying their CSEC exams, or some other educational goal, isn’t something they think they need to do. And, it’s not that they don’t have the money, many of them do. As a result, a programme, such as JN School Savers is really good,” she maintained. Nuirka Dunkley, a student in lower sixth form at STETHS, agrees that financial literacy classes, if taught in schools, would be of great benefit to young persons. “It would serve us quite well, especially sixth formers, who are a year or two away from going out into the real world. Most of us are planning to attend university, and we will need to understand how to manage our money, as it will be the first time that many of us will be on our own,” she stated. Nuirka, who has an account with the JN School Savers programme, said she plans to pursue studies in medical sciences at The University of the West Indies (UWI), and has been saving towards that goal. “I am saving for my future, and while I am aware that what I have put aside in this account is small, I believe it still counts for something; and will provide some help to my parents,” she said. Some 900 schools across Jamaica are currently participating in the JN Bank Schools Savers’ Programme, which was launched in September 2001. The initiative is designed for young people to develop a sense of thrift and to assist them to cultivate the habit of saving from a tender age. The JN School Savers’ Dream Big Promotion runs from October 2, 2017 to June 15, 2018 and is open to students at the primary and secondary levels. Under the initiative, students who open a JN School Savers’ account and save consistently during the promotion period are eligible to win big prizes. The main prize is a trip for four to the Jewels Water Park in Runaway Bay. The next stop on the JN School Savers’ Dream Big tour will be at the Greater Portmore Primary school in Portmore, St Catherine on Friday, March 16.